DOUBT – A PARABLE playing through June 22nd at Oldcastle Theatre Company in Bennington, VT. The play is set in the fictional St. Nicholas Church School, in the Bronx, during the fall of 1964. It opens with a sermon by Father Flynn, a beloved and progressive parish priest, addressing the importance of uncertainty (“Doubt can be a bond as powerful and sustaining as certainty,” he says). The school’s principal, Sister Aloysius, a rigidly conservative nun, insists upon constant vigilance. During a meeting with a younger nun, Sister James, it becomes clear that Aloysius harbors a deep mistrust toward her students, her fellow teachers, and society in general. Naïve and impressionable, James is easily upset by Aloysius’s severe manner and harsh criticism. Aloysius and Father Flynn are put into direct conflict when mysterious circumstances lead her to suspect that misconduct by the priest may have occurred. Flynn’s next sermon is on the evils of gossip. Aloysius, dissatisfied with Flynn’s story, meets with a student’s mother, Mrs. Muller. Despite Aloysius’s suspicions and attempts to shock her, Mrs. Muller ignores Aloysius’s accusations, leaving the nun more determined to act further upon her suspicions, which have now become beliefs. The plot twists and turns smoothly as it evolves, not only testing the audience members’ tolerance, but leaving them in doubt of their own belief structures and how they feel about the action being played out in front of them. The extremely well chosen ensemble cast of Tim Dugan as Father Flynn, Christine Decker as Sister Aloysius, Meredith Meurs as Sister James, and Nehassiu deGannes as Mrs. Muller, delivers a near flawless performance. 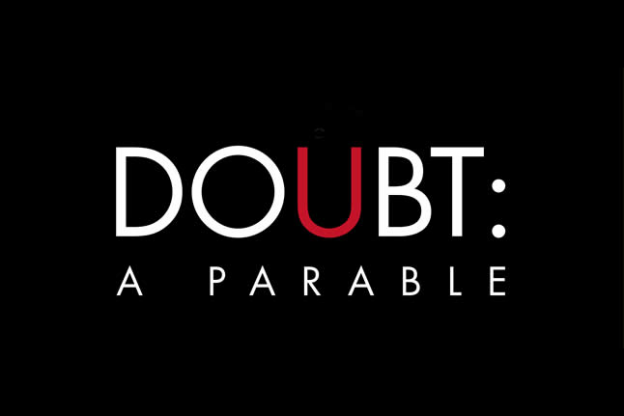 I have no doubt; you should see Doubt, A Parable is playing through June 22nd at Oldcastle Theatre Company in Bennington, VT.